The year is 1289. King Philip the Fair of France is a great alliteration – phonetically speaking – and enacting a plan to fortify the borders of his empire. One place to benefit from this economic stimulus package is Caylus, currently an inconsequential piece of mud with a bridge and an inn but soon to be a cornerstone of the French defensive line and a striving centre of craft and commerce. But for the moment, it’s still miles and miles of mud. In case you haven’t guessed it already, bringing the place from mud flats to actually being mentioned on the map is your job in Caylus. And so, the players move in on the village with their small teams of 6 workers and start construction immediately. 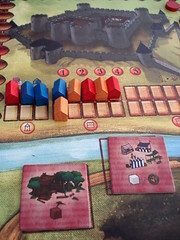 Caylus is a worker placement game, and while it’s not patient zero for the genre it is a very early example and one of the first to draw wide attention to this then new mechanic. But Caylus takes the idea of worker placement further than most other games: workers are only half the equation, you also need somewhere to place them. Most worker placement games are static in that respect, there is a fixed set of locations where you send your workers, and that’s it. In Caylus you start with some locations already on the board, but mostly you build them yourself, along the yellow mud road. Doing so is actually much easier than the rulebook – at least the German one – makes it sound. First, the players take turns placing workers on the board. Each location can only take one worker. Then, starting from the castle construction site, you follow the road and activate every location as you come across it. The rulebook needlessly splits the road into three phases – special buildings that are printed on the board, the bridge and then the regular buildings – but if you just follow the road, you’re playing exactly right and the game suddenly feels much less threatening than the rules made it seem. Which is not to say that Caylus is a straightforward game. The actions you can perform at each location are diverse and not all of them appear immediately valuable. Most of the regular buildings you construct during the game are simple: you collect one or more resources (food, wood, stone, cloth, gold or money), you trade one resource for another or you construct a new building. And some buildings – the blue prestige buildings – simply award victory points. The more complex part lies in the special buildings up to and including the bridge. Here, you can do things like change the player order, negotiate a better price for placing workers or buying the king’s favour by holding a tournament. King Philip’s favour is a resource you shouldn’t underestimate: each time His Royal Highness smiles on you, you chose between four favours he can bestow: victory points, money, resources or the chance to use one building immediately, without paying and without using a worker – even when the building is not on the board yet. All favours become more potent the more often you chose them. The special buildings let you control one more wrinkle that ups the complexity but also significantly increases the strategic depth of Caylus. This wrinkle is known as the bailiff and the provost – that’s two people, but they add up to one wrinkle. The bailiff is a mobile roadblock: when you follow the yellow mud road your winged monkeys – excuse me, your workers – only get activated up to the bailiff’s position, every worker beyond the bailiff gets the day off. So why would you place a worker there? That’s where things become interesting: you don’t know where the bailiff will end up. He’ll start on the same space as the provost – we’ll get back to him in a second – but a player choosing the special building Merchant’s Guild may move him forward or backwards by up to three spaces. The same option is given to every player in the order they passed when execution comes to the bridge, but here every space moved costs 1 dinar. It’s perfectly possible that your important, valuable worker at the end of the street will not have his action. Of course, it’s also possible to activate additional buildings by moving the bailiff forward, but there is a small side effect: the provost, usually a sedate fellow who only moves one space after each round, will move two space when the bailiff is ahead of him. That’s interesting because the provost’s progress along the street controls when a part of the castle is scored and when the game ends. Moving the bailiff forward effectively shortens the game. Speaking of the castle: wasn’t there a point to this whole story? Indeed, a castle needs to be built! That’s what happens when all the workers on the street have done their job. 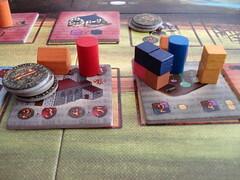 Every player with a worker on the castle may build as many parts as he can pay. The biggest spender for the turn immediately receives a kingly favour. Building the last piece of one phase of construction – or the provost passing the mark on the street, whichever happens first – triggers a scoring of the current phase of construction: every player who participated in the current phase gains the king’s favour, every player that didn’t build a single piece of the castle loses victory points. The game ends immediately after the 3rd scoring, awarding some additional points for left-over resources. As you can see, there is a lot of things going on in Caylus. Where other worker placement games give you a fixed amount of locations to spread your workers and some resources to manage, in Caylus this is just the start. Not only do you build your own locations – and potentially make money from other players using them – it also adds on variable player order, many different ways to score victory points, the option to activate or deactivate buildings on the street and player influencing the time of the scoring and when the game ends. What that adds up to is a lot of options, and for a beginning player this amount of options can easily be overwhelming. Even players with more experience will take some time to figure out Caylus‘ intricacies: when is the right time to claim the first place in the player order? When is it better to pass early, making additional workers more expensive for everyone else, instead of collecting two more resource cubes? The answer to both questions: it depends on what the other players are trying to do. More than in many other games, keeping an eye on your opponents options is paramount. It also helps to guess their strategy early and adjust your own accordingly: decide which points you will compete for and which you won’t. Especially the variable game length is a very important parameter to keep an eye on: quite a few successful strategies try to cause the game’s end as quickly as possible and win with a low score, before the other players really got going. Of course, if you recognise who is doing this early enough, you can try to to ride his coattails to an early end but make more points in the meantime. There are many different ways to victory in Caylus, and when playing with new people I’m still surprised sometimes, but no strategy is without a counter, there is no fixed route to victory. This is true with two players as well as with the maximum of five, although the game plays quite differently depending on that. The game also plays much longer with more people: four players, especially when they are new to the game, can easily push Caylus beyond the magical two-hour mark after which many groups ask to play something else. Some experience can cut down the game time, but Caylus remains a long game requiring a lot of concentration to play well – in fact, until Dominant Species came along Caylus used to be the prototypical long game for us, often used in jokes like “Lets play a quick game of five player Caylus” at two in the morning. Nevertheless, I enjoy it. If you noticed how I insist on using the word mud and the term “yellow mud road” throughout this review, now is the time to learn why. Many boardgames tend towards bright, primary colours. Not so Caylus. Caylus does its very best to invoke the bleak feeling of the middle ages with a palette that ranges from dirty green to brown to dirty yellows. 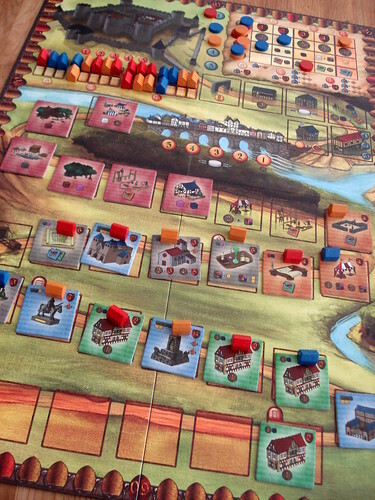 I’m not saying Caylus is badly designed, the shape of everything is okay, I’m just not happy with the colour palette that looks dirty and muddy even under bright light. Apart from that, I find nothing wrong with Caylus. If you’re looking for a complex strategic game, Caylus is a good option. Dwarves, Goblins and Knights are all united in a trick-taking card game that sounds easy and simple, there’s not even a trump colour. But The Dwarf King has changing scoring rules, wacky special cards and the best illustrations I’ve seen in a card game recently.